"Always Kuba Kuba", a play on coca-cola's tagline, is the catch phrase for this cozy bodega style restaurant in Richmond VA. Only 10 minutes from the I-95, this place is a very pleasant distraction for those, like us, who are crazy enough to make the twenty-hour trek from Florida to New York. In the heart of an area called "The Fan", specifically on the corner of Park Ave and Lombardy Street, Kuba Kuba gives an interesting twist to Cuban cuisine. Outside, the wooden bench and rocking chair give it a country home feel while the mural painting adds an element of urban Latino culture. 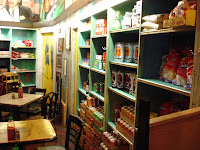 When you look around inside, you’ll realize the owner's intentions to make the restaurant look and feel like a bodega. It feels fresh and familiar like looking through my own pantry. We learned from one of the servers that the owner's father sold food products out of their home, making this theme a natural progression. They also allow customers to purchase some of the Latin American ingredients that come together to form Kuba Kuba's tasty meals. When it comes down to the food, the highlight was the Entremes appetizer. 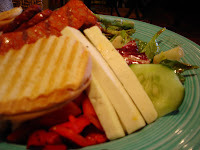 This consists of a salad topped with chorizo, queso blanco, scallops, ham, marinated olives, and Amazing roasted garlic! which is so good that i popped the whole cloves in my mouth like candy. There is also Cuban toast on the side that seemed to be a hit with Jaquie. It was as if the chef read my mind and placed all my favorite foods in a bowl. Amazing, to say the least, right down to the homemade Balsamic vinagrette. Needless to say that when the server brought my entree, I completely ignored it. 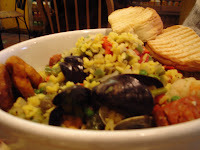 Jaquie ordered the Paella Valenciana that skews from the traditional dish because of the soupiness and concentration of veggies. The dish has potential, but the presence of so many salty capers built a roadblock for our taste buds, making that the lasting impression. I enjoyed the Kuban roast pork that was seasoned well and marinated in a savory mojo sauce. Though I tried to get along with the rice and beans because I typically love this combination, it seems to be a bit bland and lacking a little something something. 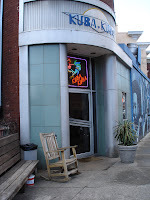 While the food has it's extremely high highs and not so low lows, Kuba Kuba is worth the visit to experience its creative decor and community feel. The people are friendly and customers seemed happy and at home. It's pleasing to see unique Latin style so openly accepted in a city where less than 3% of the population is Hispanic. If you have a chance, check out the restaurant's site and keep it in mind if you’re ever in the area. Many hear the word Tamales and immediately think of the red cinnamon flavored candies. Though picking these chewed up candies from my teeth is one of my favorite activities, original tamales are much more delicious. 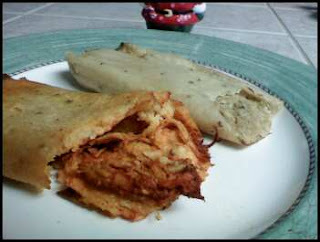 Tamales are the first lunchbox style food and were originally consumed by ancient Aztec warriors during their travels. 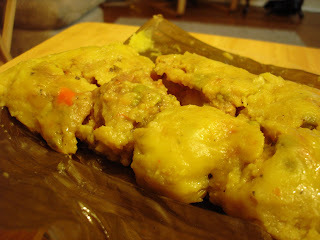 Ingredients are placed inside a pocket of corn dough (masa) which are then wrapped in corn leaf or plantain leaf and steamed or boiled to perfection. 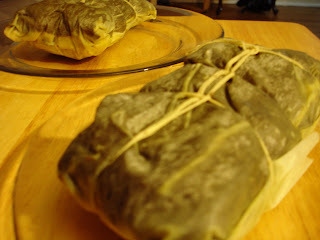 Tamales are popular during holidays, when families collaborate in making these wrapped delicacies. The Colombian Tamales in the first two pics were purchased at Los Toldos, a cozy Mom and Pop restaurant in Queens, NY on Northern blvd and 84th street. Depending on the region, you will see differences in size, texture and ingredients. Since my background is Colombian and my girlfriend, Jaquie, is Mexican I decided to put these two Tamal counterparts head to head. Can fit about 4 Mexican Tamales. Made with moist and buttery corn dough. Contain full pieces of pork, peas, carrots, and onions. Paired with delicious Colombian white rice and spicy cilantro and onion based aji sauce on the side. Can include meat, cheeses, chiles(rajas) or any combination of the above, usually with a spicy kick. These tamales were from our Christmas dinner in El Paso, TX. I'd recommend reheating in the toaster oven for crispy yumminess! While I wish I could stay true to my Colombian roots, I must admit that I would choose a Mexican tamal if they were both placed in front of me... unless my mom was looking (wink wink). Fifty random New York city dwellers were asked the same question. What comes to mind when you think "Latin Food"? Answers were mixed based on people's expertise on the subject, but the top four answers were: Burritos, Tacos, Rice & Beans and Chipotle (Not the smoked pepper, the restaurant chain). Now, I have nothing against Chipotle. As a matter of fact I endure the long lines every so often for a burrito bowl of Carnitas with hot sauce, some corn, a little sour cream and cheese. For those of you that have never eaten here, your choices are limited to a burrito, burrito bowl, salad or tacos. BUT, you better know exactly what you want when you arrive at the counter because when it's your turn, the pressure is ON. Ordering now leaves no room for "ummms". Here, the soup-nazi style production line will satisfy the daily Mexican or Latin American food cravings of thousands of Gringos from coast to coast. Just from looking at the extensive lines, you come to realize "Americans love Mexican Food". But Mexican, and Latin cuisine in general, extend so much further Beyond Burritos. The variety of flavors and ingredients are endless. Being Colombian myself, I have been blessed with opportunities to live in Colombia and visit several Central/South American and Caribbean countries and have fallen deeply in love with the cultures, especially the food. The census estimates that by 2010 the population of the US will be 15% Hispanic and grow 10% more in the next 40 years. Latin eateries are springing out all over America beyond just Mexican food. I think everyone should be exposed to these wonderful cultures, which is why I have set forth on this mission. Beyondburritos.com is a journey through the world of all Hispanic cuisine from street food to fine dining beginning in New York and other US regions. Down the pipe, we will explore the food cultures by touring the countries of the food's origin, but Baby Steps. So i welcome you to join me in this amazing journey. At first, I'll be posting once a week, and comment away because feedback will only help the journey.